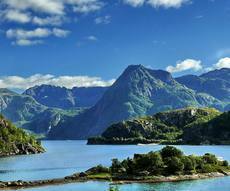 Providing lovers of nature an unlimited pleasure, Norway is one of most beautiful countries in the world. Lady Nature reigns everywhere you go: fjords, forests, rolling hills and green meadows... These sweet monotony landscapes metamorphose suddenly in high Rocky Mountains. The Norwegians gave a lesson of complete harmony with it. Fjords cut the west coast of Norway, extending over nearly 3.000km. 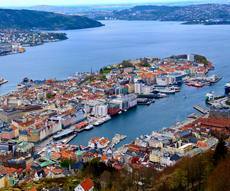 Ferries carry you everywhere: to the islands, fishing villages and caches of the fjords. Inside, peaks, glaciers, forests and tundra landscapes are amazing to be discovered by walk, ski, sled or train. 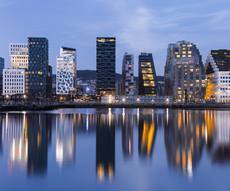 The Norwegian cities live peacefully. The history is evident in carved wooden churches and Vikings boats saved from the waters. Choose well the season before going, it might be one thing or the opposite. The midnight sun or the polar night. From mid-May to early August, the sun does not lie, even in southern Norway. The night is only a long twilight. And then it is the reverse. The polar winter night descends to north of Arctic Circle and is installed for several months in northern Norway. And you have all the time to scrutinize the sky in search of Aurora Borealis. 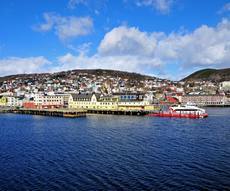 La météo changeante et les sites très variés du Harvadanger Fjord mais aussi de l'île d'Osteroy où nous avons navigué permettent une expérience tout à fait unique de croisière nordique exotique et enrichissante à tous points de vue. La Norvège et sa culture maritime, ainsi que les programmes possibles, innombrables, entre fjords et mer norvégienne rendent la destination tout à fait recommandable.